Zoom Hash offers a console-only based Raspberry Pi image in the form of a very basic solution along with a short guide and instructions for installing the image. Their RPi image is freely available for download, requires 4GB and contains a compiled cpuminer for Scrypt only mining. Easily configurable via a command line script. You can login with user/pass – pi/zoomhash. MinerEU does provide a very basic console-based Raspberry Pi image with support for Gridseed ASIC devices. The company does not currently sell Raspberry Pi devices, so you cannot buy a ready controller solution with the software, but if you have the hardware you can set their image on your own and try it out. The image is 8GB, comes with compiled cpuminer and cgminer and does support scrypt only mining, there is no web interface, everything is controlled through the console. You can login via SSH as root user with username/password – root/minereu. Hash Master does provide their Raspberry Pi image along with the device only if you purchase the complete controller package from them. We could not find their Pi image available for download other then the complete package they offer as a Pi-based controller with SD card and preloaded image on it, so we are not going to be able to test this image, but it seems to be pretty much Scripta with some visual modifications and the proper cgminer for Gridseed. We haven’t been able to test it, so we can’t report anything, though it probably handles well being based on Scripta (earlier version though). They do sell their RPi controller a bit pricey considering the normal price of the hardware you get. 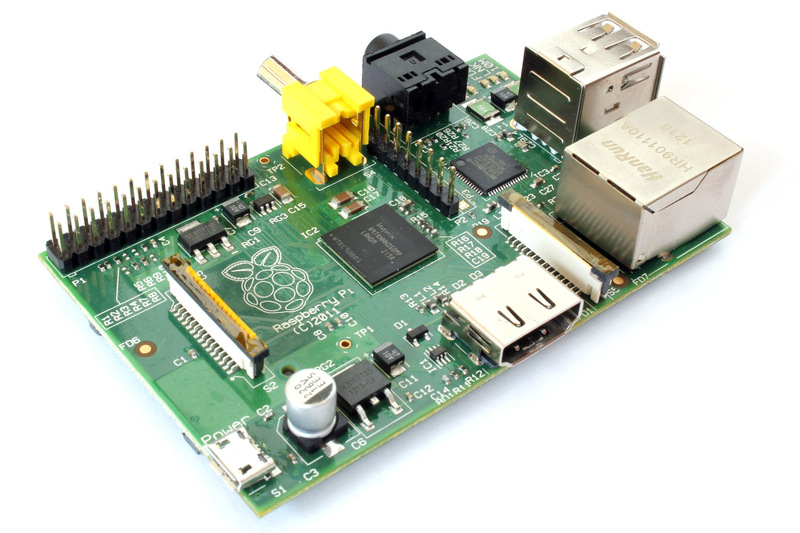 Hashra provides a downloadable Raspberry Pi image for use as a controller solution for Gridseed ASIC devices. The version you can download from their website is 1.2, though you can easily update from the web interface to the latest version of the software (the web-based part) and we have done most of our testing with version 1.2.7 and there is a newer one also available. The good thing about Hashra is that their software is basic and easy to use and provides easy access for both scrypt only (bfgminer), SHA-256 (cgminer) only or dual-mining mode (cpuminer + cgminer). The drawback we did not like much is that there is no root access avaialble for you to have full controll, though there is a user fixed image available. The 1.2.7 was lacking the ability to overclock past 900 MHz, but the latest 1.3.3 version has that fixed with up to 1300 MHz selectable and a bit cleared interface. We like that solution quite a lot, though the load on the RPi and the lack of root access is a bit of a drawback, still probably the best option for dual mining. What is still missing as a feature is the support for backup pools if there is a problem with the main one you have set. Scripta is our favorite solution so far at least in terms of features, especially after getting an image made by user that has everything setup and ready for use with Gridseed support, so no need to modify and compile things yourself. That particular image by mox235 is available here for download and it is really nice and easy to be used. Note that Scripta does support only Scrypt mining, you need a 4GB card, and the solution with mox235 comes with a modified version of girnyau’s version of cgminer that supports per device overclock via serial number (700-1400 MHz). You are able to pass individual parameters to cgminer, so no fixed drop down boxes to set frequencies for example, the web interface also does support reporting of serial number and device frequency, helpful when overclocking different devices with different frequencies. The image uses HTTPS for the web interface, though it relies on self signed certificate, so you will get a warning when trying to login, the default web password is scripta. You have full root access with user/pass – root/scripta. The thing that we did not like very much is that the miner control options do not seem to be working well, so when you change settings it is a bit frustrating to get them applied. The best options you have are probably the Hashra and Scripta images for RPi, both seem to work pretty well, though you may still have some issues running them, especially if you plan on using a lot of Gridseed devices connected to them. It is important to monitor them carefully initially to ensure that your setup is working well before leaving the Raspberry Pi to handle things on its own. You are welcome to share your feedback and suggestions based on using any of the above RPi images with Gridseed support. Do note that so far we have been testing with a single Gridseed ASIC devices and we are now just going to add more miners to see how well will the Hashra and Scripta images going to handle more ASICs on the long run. 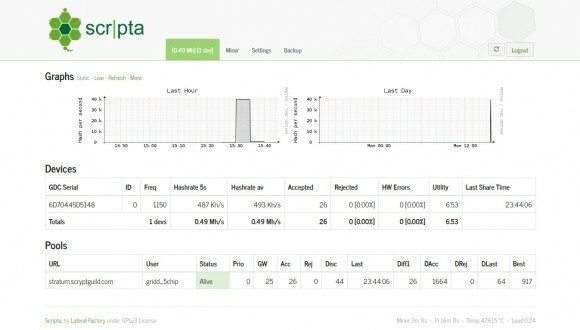 Scripta is a Litecoin mining distribution for Raspberry Pi that provides a web interface for easier controlling, configuring and monitoring your mining devices. Originally it does not support Gridseed devices, but by replacing the supplied cgminer with a one supporting Gridseed ASICs you can easily make it work with Gridseed devices as well. In fact we suspect that most of the other images available below are based on Scripta based on some screenshots we’ve seen even though we still haven’t started testing any of them. MinerEU does provide a dedicated Raspberry Pi image for Gridseed usb miner to their customers only. The image is now freely available, so you can download it and try it out if you are interested. We are going to give it a try for sure. Hash Master apparently does provide their Raspberry Pi image along with the device if you purchase the complete controller package from them. We could not find their Pi image available for download other then the complete package they offer as a Pi-based controller with SD card and preloaded image on it, so we are not going to be able to test this image, but it seems to be pretty much Scripta with some visual modifications and the proper cgminer for Gridseed. Zoom Hash does not give out much information about their image or even screenshots, but has a short guide and instructions for installing the image along with a download link available for everyone. We are going to be trying their image for the Raspberry Pi. Hashra also does provide an image with some instructions to setup and use the Raspberry Pi as a controller for Gridseed ASIC devices. They do not sell RPi separately, but include it with their 20 miners package as a controller for the ASIC devices. They call their software for RPi Hashra Controla and it has web-based interface available. This is it for now, time for testing the images. If you know about another Raspberry Pi image for Gridseed ASIC miners please feel free to share information about it so that we can include it in the list and also test it along with the others.